Studies show that of kids who ski with a grandparent, nearly 95% continue the sport when they grow up. Here are 6 reasons to take to the slopes with kids. Four Utah residents and their different connections from WWII to the slopes of the Wasatch Mountains. You snooze, you lose. This year, some of the best discounts end before summer starts. And that includes students, adults, firefighters, seniors and all the other categories. How Wheaties, the Breakfast of Champions, kept champion ski jumper Alf Engen from competing. Squeak more time out of your hand warmers and have fun keeping your noodle warm. If you like to do extreme things, try digging a silver mine tunnel with your eyes shut. That's what the Blind Miner did and he wasn't complaining. Enjoy reciprocal deals, discounts, perks and the UTA ski bus. Enjoy summer at Beaver Mountain. There are endless outdoor activities from biking, to fishing, to ATV off-roading. Alan is a flash point of creativity and skill. So why don't you know of him? His low key profile surges to effervescence when he performs in mime white face or coaches up-coming athletes on his 2 ton ski simulator. Eating right is like building a campfire, says Allen Tran, the High Performance Chef and Dietician for the U.S. Ski and Snowboard Association. Athletes need kindling to fire up their bodies and then big logs to keep the fire going. He coaches the world-class athletes how to eat for performance and he keeps it simple so they can make nutritious meals while they're on the road. It was the 1930s and the country was mired in the Great Depression. Alta was a wasteland at the top of Little Cottonwood Canyon, and it was often slammed by avalanches and mudslides. Alf Engen looked down from Catherine Pass into Alta and said: "Ya, I think Alta would be good for skiing." He added that the first tasks would be to chase the sheep back to Heber and close hundreds of open mine shafts that riddled Alta. Snowbasin was founded from a desperate need for clean water. And iconic skier Alf Engen and a German beer brewmaster had a hand in its creation. Clean water, great runs and good beer is still the classic mix for resorts. This year Snowbasin celebrates its 75th anniversary. 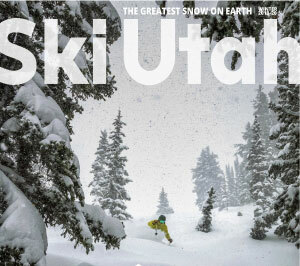 After 40 years of promoting The Greatest Snow on Earth, Ski Utah earns the top award at the Ski Archives gala. Sometimes floating as high as 70 feet in the air, above the water, the Flying Aces are legit and shouldn't be missed. Cherry Peak Resort plans to open this winter for its inaugural season. Here's a sneak peek on all the happenings taking place. Skiing with an extension ladder is a bad idea. How the times have changed. We caught up with Alan Engen, a legend, born into Utah's first skiing family. Low temperature fluid is good for canyon driving. Do you have expired hand warmers? If so, throw them out! Don't wait, sign up for a ski lesson now. Are you old enough for a Senior season pass? Great rates but goofy deadlines. When it's adults vs. kids, kids always win. Junior's advice for seniors: "Keep moving." Some tips to stay warm that I bet you never thought of. The Wasatch Front's original senior ski group. Everybody loves hot deals. Are you old enough to get senior prices? Deep powder, a daily workout and the love of skiing. Let’s grow up like him. How do seniors kick up their heels during Spring Break? You’d be surprised. Some kick them up. Some dig them in. Enjoy trailside art at Deer Valley. Do you hear that rumble? It’s Baby Boomer seniors hitting the slopes.